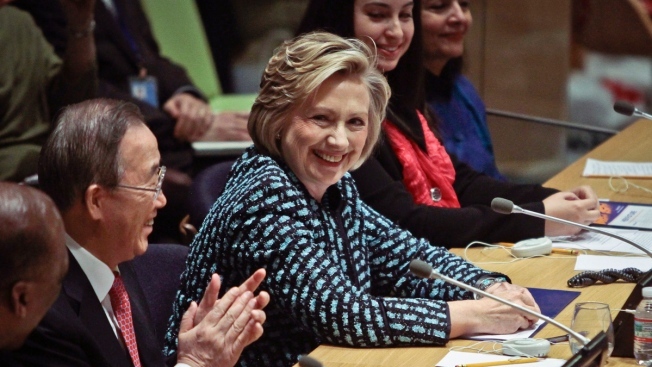 U.N. Secretary-General Ban Ki-moon, second left, welcomes former United States Secretary of State Hillary Rodham Clinton, center, at a U.N. meeting to kick off events for the International Women's Day-8 March, Friday, March 7, 2014 at United Nations headquarters. News4 has learned Sen. Tim Kaine (D-VA) will endorse Hillary Clinton to run for president in 2016, if she chooses to run. Kaine, a former governor and Democratic National Committee chairman, is in South Carolina this weekend as a keynote speaker for the Jefferson Jackson dinner. Seven years ago, Kaine was the first governor outside of Illinois to endorse Barack Obama for president -- over Clinton. Clinton has yet to announce whether or not she will run.